Illuminating and cheerful, this retro chandelier twinkles with brilliance. 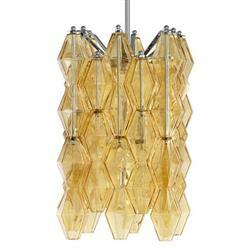 Light amber glass adds luster to this lovely hanging fixture. Four candelabra bulbs shine brightly in an entryway or over a dining table. The chrome finish on the hanging rod and medallion creates a modern contrast with the gorgeous glass.